KAMPALA – Nokia as a brand may be no more but the foundation it set as a manufacturer of durable handsets is seemingly being upheld by Microsoft Mobile Devices. Despite sustained pressure from competitors like Samsung, Apple, Blackberry and countless counterfeit gadgets mostly from China, Nokia maintained its place as a reliable handset. The acquisition of the Finnish Company’s Devices and Services business, both Smart Devices and Mobile Devices by Microsoft in 2014 for over $7 billion seems to have been a step in the right direction. Nokia was already Microsoft’s partner ever since it started supporting the Windows platform in 2011. According to commentators, by adding Nokia onto its catalogue, it meant that Microsoft could henceforth work on both firmware and hardware, theoretically making the process of developing, manufacturing and distributing a new phone or tablet much more efficient. By selling off its mobile devices division to Microsoft, some IT experts say that Nokia made the right move given that it was ‘lagging behind’ in the race to become the preferred smartphone. As its peers like Samsung, Apple and even Blackberry ventured into the ‘touch’ screen era, Nokia at the time decided to maintain a conservative approach. The firm continued churning out ‘feature phones’ complete with buttons. Even its QWERTY keyboard buttons did not really captivate the market as Nokia had hoped. By the time Nokia fully entered the touch screen arena, it was merely playing catch up. However, as mobile telephony evolved and mobile handsets went beyond just making phone calls and texting, there was need for a deep-seated approach. In a competitive marketplace Microsoft realized that customers’ tastes and preferences are dynamic and are continuously evolving. “We are not here to compete on specs but on the overall user experience,” emphasized Kingori Gitahi, the Products Marketing Manager for Microsoft Mobile Devices. “Our mobile devices are carefully crafted to provide a platform for our customers to get the most out of their gadgets,” Kingori added. Gitahi was speaking during the launch of the ‘entry level’ Lumia 435 and 532, the most ‘affordable’ of the Lumia range in Uganda yesterday. The debut of the Lumia 435 and Lumia 532 means customers now have even more choices for an affordable, powerful and innovative smartphone packed with the latest Microsoft services to help you get things done. “The Microsoft Lumia 435 and Lumia 532 show our commitment to bring Windows smartphones to as many people as possible. 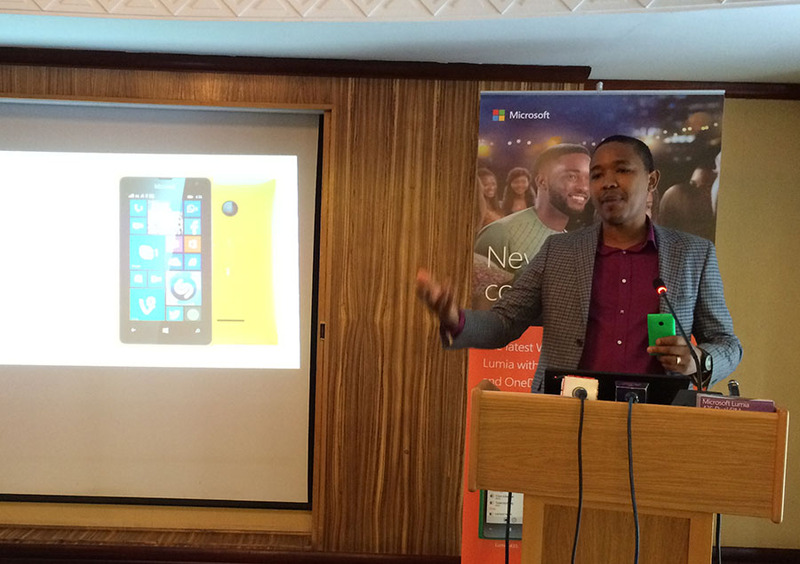 Both devices are fantastic for those moving to a smartphone for the very first time”, added Mariam Abdullahi General Manager, Microsoft Mobile Devices East Africa. Both devices max out at 3G connections too, and arrive in single and dual-SIM variants. Just like other low-to-mid-range Lumias, the two offer interchangeable rear shells in green, white or orange. However, the 4-inch display on the 435 and 532, have a resolution of just 800 x 480 pixels. Similarly, the 435 offers only a 2-megapixel snapper on the rear, while the 532 bumps this up to 5-megapixels. On the plus side, both come Windows Phone 8.1 and the Lumia Denim update pre-installed. They are also have Microsoft’s Office suite (Word, Excel, PowerPoint and OneNote), Outlook for email, seamless Skype integration and front-facing camera for Skype video calling, HERE location services, up to 30GB of free cloud storage on OneDrive, and access to thousands of apps in the Windows Phone store. Both phones also have outstanding hardware and battery performance.